Our work involved exploring options for enhancing the existing route corridor of the M4 motorway link and key gateway to Heathrow Airport. We prepared initial concept design options (including soft landscape, art and lighting), for consultation with the project stakeholder group including Highways England, BAA, the Civil Aviation Authority and local landowners. Three concept design options were developed at different cost brackets and levels of maintenance requirement. 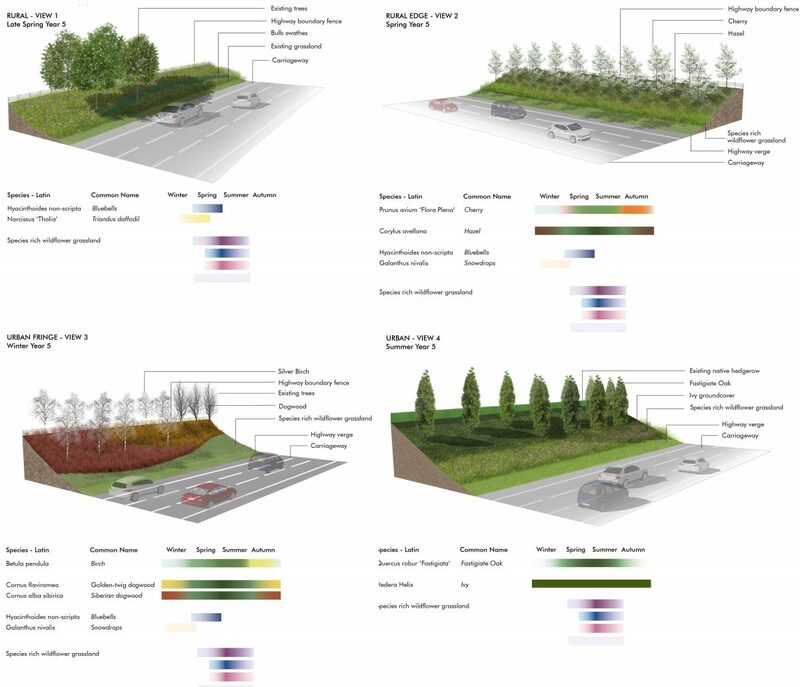 Particular scheme design challenges included the narrowness of the existing highways verge and specific CAA requirements associated with birdstrike as well as highways clearance of structures and planting and adjoining commercial and other uses. The preferred design option responds to the wider character context and setting of the route to emphasise the journey from a more rural to urban landscape. The scheme centres around retaining the existing framework of vegetation where it provides screening, maturity and structure and incorporates a curved swathe of wildflower grassland and shrub planting to tie the scheme together. Different tree forms highlight the change in landscape character from rural to urban. The planting scheme incorporates complementary species and planting in bold blocks to ensure that a high impact is delivered to viewers travelling at the national speed limit whilst also meeting stringent aviation and highways requirements. We have subsequently worked up the preferred design option as a detailed technical design including landscape specification, costings and contract documents.